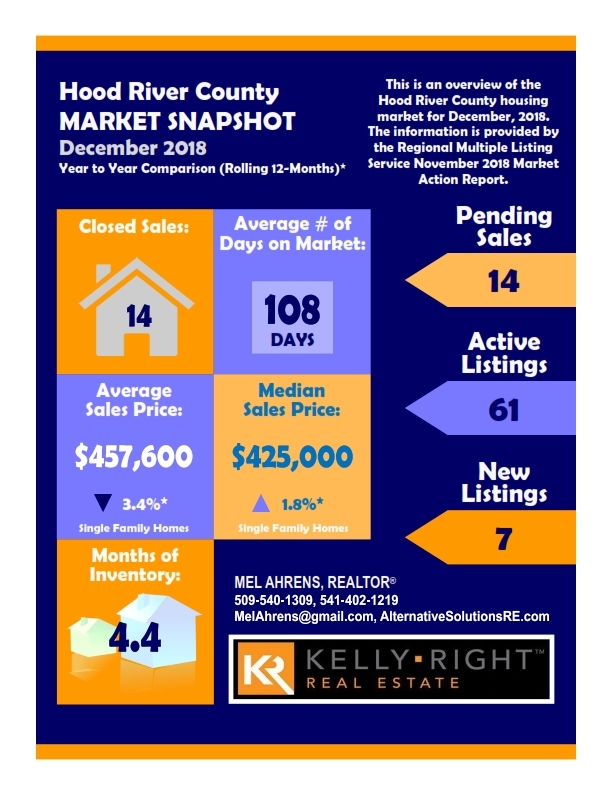 This is a quick overview of the December 2018 Hood River County Real Estate market. The average* sales price has DECLINED by 3.4% compared to December 2017. The median* sales price has increased by 1.8% compared to December 2017. The decline in average sales price is driven by higher priced homes staying on the market longer, while lower priced homes generally continue to sell sooner. Home inventory for December 2018 increased to 4.4 months, a 19% increase over November 2018 (3.7 months) and 21% below December 2017 (5.6 months inventory). Looking back 2 years, the December 2016 home inventory was only 2.9 months. This Is a 52% increase in home inventory for December 2018 compared to the same period 2 years ago. Inventory has improved over the last two years if you are a buyer. A normal market typically has 6 months of home inventory. If you would like to look at the market for your specific home, please email me or call me at (541) 402-1219 or (509) 540-1309. *Note – The average and median sales prices are calculated on a rolling 12-month basis. This smooths out the monthly variability and provides a truer trending result for the time period being reviewed.